blog.HalloweenAdventure.com | Latest News from the Costumes Trend FrontLines! : Jetsons Live Action Movie Coming! Jetsons Live Action Movie Coming! 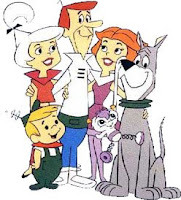 Love the Jetson family as much as we do? Then you'll be as excited about this news as we were. Famed Dusk till Dawn, El Mariachi, Sin City and Spy Kids director Robert Rodriguez is working on preproduction for live action version of the Jetsons. Adam F. Goldberg from Fanboys completed a script for the movie in 2007 but Rodriguez has been hard at work retooling the script. He's also been pretty tight lipped about casting for the movie. Here's hoping that the movie doesn't turn out like the live action version of the Flinstones. With Robert Rodriquez at the helm I have some faith in the project. In the meantime take a look at these re-imagined Jetsons costumes inspired by the original cartoon characters Judy and Jane never looked like this in the animate series. We're a bit obsessed with this Jane Jetson costume. That shiny purple dress! Sparkly! Metallic! Purple! Futuristic! It's just oh-so-fabulous! Even Judy's costume is fantastic - a shimmering pink zip up number that is sure to have all the guys calling. 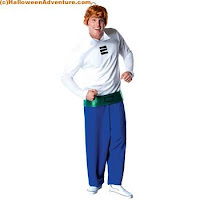 Men will love our George Jetson costume, while kids will adore our Astro dog costume. Putting it on the family dog is a hilarious activity in and of itself. If you were casting for this movie who would you cast for Judy,Jane, Elroy, George and Cosmo? Imagine casting has compiled their own list of predictions from user votes.